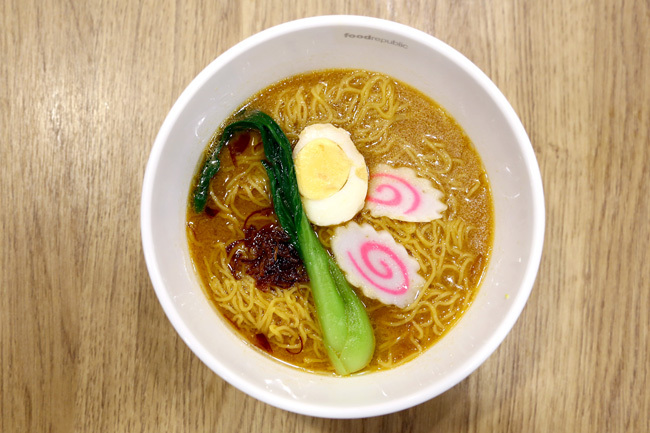 Compared to the other Japanese noodle counterpart – The Ramen, Udon only got more popular in Singapore during recent years, largely contributed to the opening of Tamoya Udon. 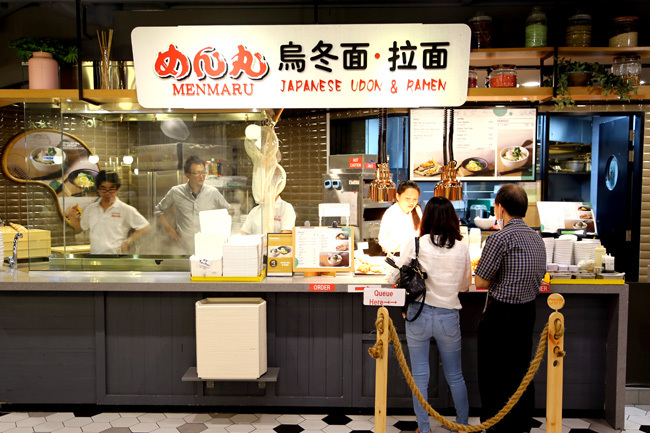 Menmaru Udon (Isten Scotts), Udon Goen (Wisma Atria) and Idaten Udon (City hall) are all new udon entries to the local market. 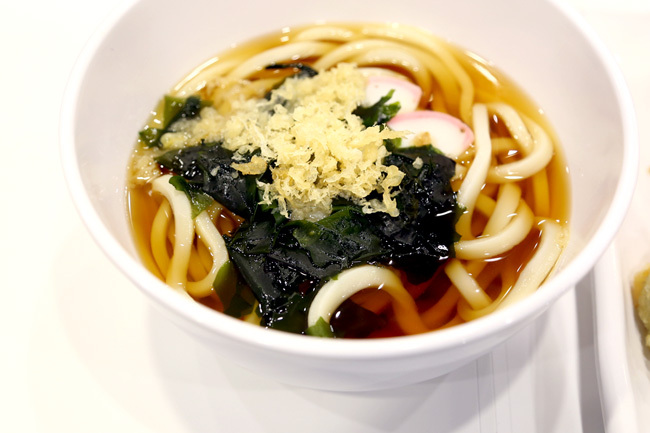 However, they are more or less similar in styles to Tamoya’s, mainly self-service, affordable bowls below $10, serving simple kake udon with ala-carte deep fried items as options. Okay, it does get less exciting (ie boring) after a while. Udon didn’t exactly take off in a big way in Singapore, with comments such as “too thick”, ”too filling”, “too plain”. I don’t actually mind the thicker wheat flour noodle, but it is hard to find a good bowl comparable to Japan’s standards. 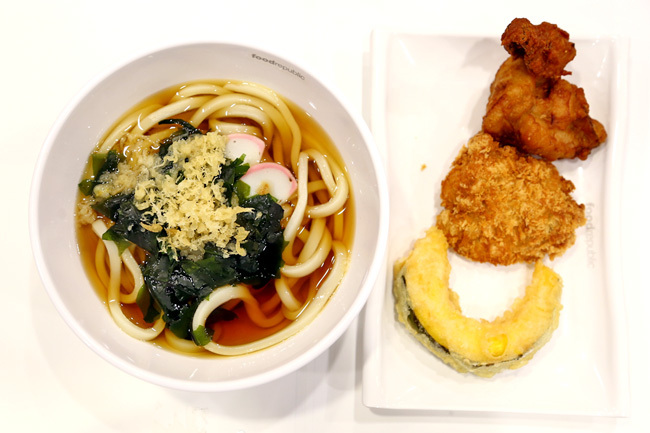 Menmaru found within Food Republic serves up two basic types – clear Kake Udon ($4.50 / $6.50), or soya based Menmaru Udon ($4.50 / $6.50). 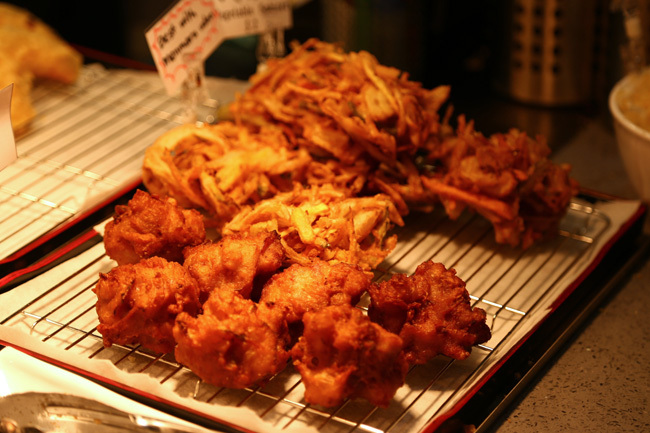 Side toppings include Prawn Tempura ($3), Chicken or Pork Cutlet ($3), Kakiage ($2), Fried Chicken ($2). Not too oily, generally acceptable. The fried chicken was juicy, and pumpkin fresh-tasting and sweet. Is it too much if I came expecting fresh hot ones? Maybe. I enjoyed the clear soup base, noodles a tad thick for my liking, and perhaps cooked not chewy enough, tiresome to bite after a while. The Miso Ramen ($7.80) has the potential to be a great-tasting bowl, for a food-court standard at least. The broth was rich and tasty, springy noodles similar to mee kia, but everything is kind of just assembled together. The egg was a ‘fail’. “I think they just took it out the fridge,” my dining partner quipped.